in Health, Oswaldo Cruz Foundation, Rio de Janeiro, Brazil. 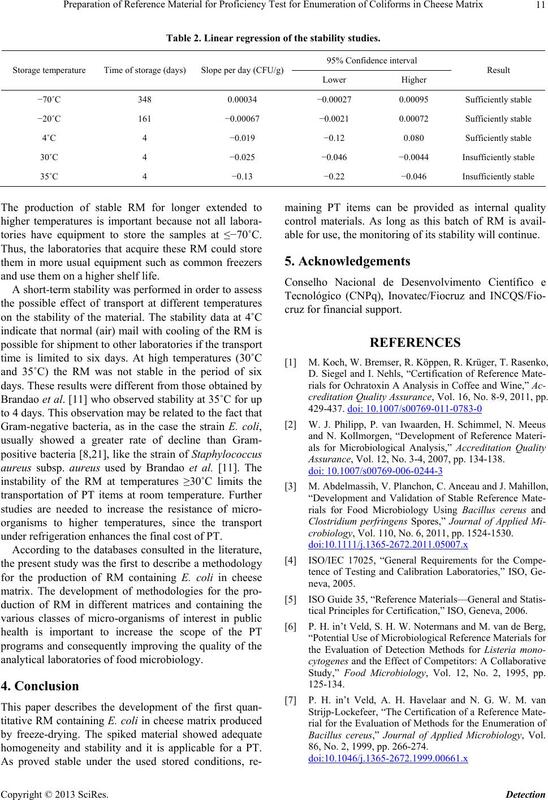 RM produced was considered sufficiently homogeneous and stable at ≤ −70˚C during the entire study period (348 days). 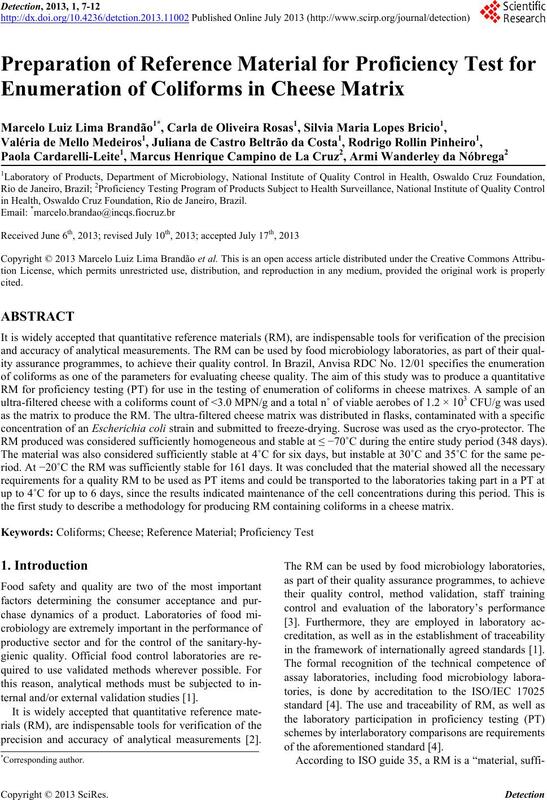 the first study to describe a methodology for producing RM containing coliforms in a cheese matrix. ternal and/or external validation studies . precision and accuracy of analytical measurements . in the framework of internationally agreed standards . of the aforementioned standard . be fit for its intended use in a measurement process” . stable over a determinate period of time . food RM containing micro-organisms . (0.1 mmHg; Liotop, São Carlos, SP, Brazil). than 13 Pa (0.1 mmHg; Liotop, São Carlos, SP, Brazil). under vacuum and stored at ≤−70˚C. apparatus (Seward, Fisher Scientific, Canada) for 1 min. of the batch, and c is the critical value. intervals until a total of 161 days (classic approach) . of the study period (isochronous stability study) . total viable aerobic micro-organisms of 1.2 × 103 CFU/g. in a food sample . 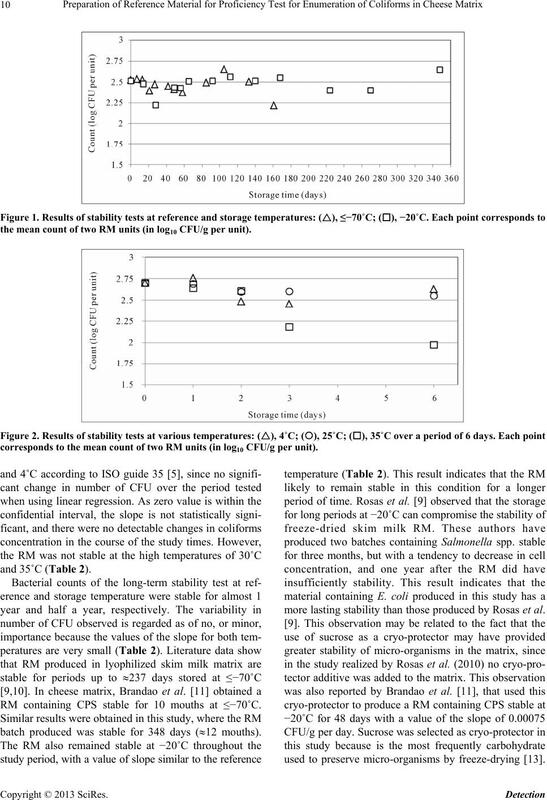 November 2012 at −20˚C are present in Figure 1.
over a period of 6 days. Table 1. 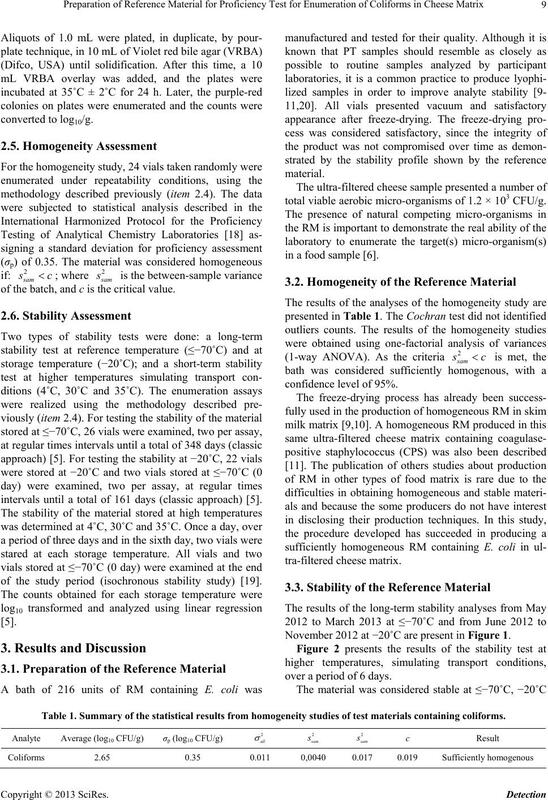 Summary of the statistical results from homogeneity studies of test materials containing coliforms. the mean count of two RM units (in log10 CFU/g per unit). corresponds to the mean count of two RM units (in log10 CFU/g per unit). RM containing CPS stable for 10 mouths at ≤−70˚C. batch produced was stable for 348 days (12 mouths). more lasting stability than those produced by Rosas et al. used to preserve micro-organisms by freeze-drying . Table 2. Linear regression of the stability studies. tories have equipment to store the samples at ≤−70˚C. and use them on a higher shelf life. under refrigeration enhances the final cost of PT. analytical laboratories of food microbiology. homogeneity and stability and it is applicable for a PT. able for use, the monitoring of its stability will continue. creditation Quality Assurance, Vol. 16, No. 8-9, 2011, pp. Assurance, Vol. 12, No. 3-4, 2007, pp. 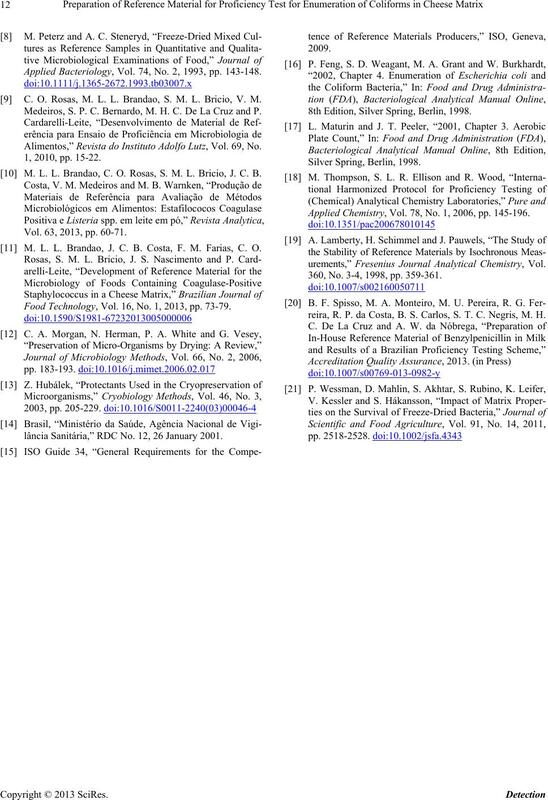 134-138.
crobiology, Vol. 110, No. 6, 2011, pp. 1524-1530.
tical Principles for Certification,” ISO, Geneva, 2006. 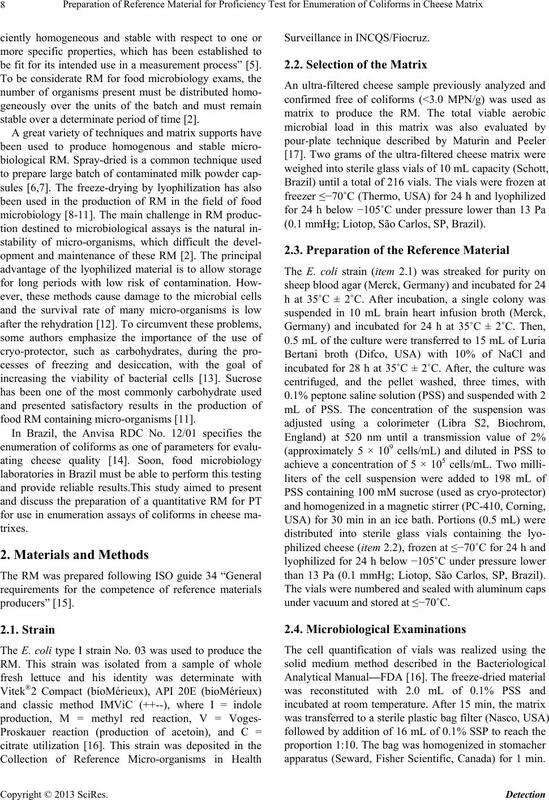 Study,” Food Microbiology, Vol. 12, No. 2, 1995, pp. Bacillus cereus,” Journal of Applied Microbiology, Vol. 86, No. 2, 1999, pp. 266-274. Applied Bacteriology, Vol. 74, No. 2, 1993, pp. 143-148. C. O. Rosas, M. L. L. Brandao, S. M. L. Bricio, V. M.
Medeiros, S. P. C. Bernardo, M. H. C. De La Cruz and P.
Alimentos,” Revista do Instituto Adolfo Lutz, Vol. 69, No. M. L. L. Brandao, C. O. Rosas, S. M. L. Bricio, J. C. B.
Vol. 63, 2013, pp. 60-71. M. L. L. Brandao, J. C. B. Costa, F. M. Farias, C. O. Food Technology, Vol. 16, No. 1, 2013, pp. 73-79.
lância Sanitária,” RDC No. 12, 26 January 2001. 8th Edition, Silver Spring, Berlin, 1998. Applied Chemistry, Vol. 78, No. 1, 2006, pp. 145-196.
urements,” Fresenius Journal Analytical Chemistry, Vol. 360, No. 3-4, 1998, pp. 359-361.
reira, R. P. da Costa, B. S. Carlos, S. T. C. Negris, M. H.